Who can forget the scene in "Poltergeist" where the family realizes that their home is built on a cemetery? "You left the bodies and you only moved the headstones!" The biggest headstone I remember is "Sugar." All kinds of products dropped the word "Sugar" from their titles when we started to get all aware of it in the 1970s and 1980s (Sugar Frosted Flakes, anyone?). Turns out that some kids' cereals were 50% sugar. No wonder we got all jacked up and ran around the house imitating The Bugaloos while jumping on the couch pretending to fly. 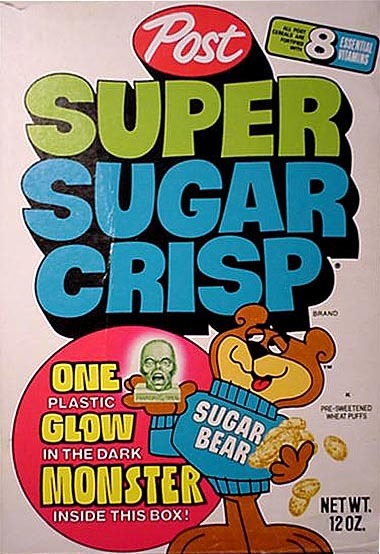 Most memorable for me is Super Sugar Crisp, which was a great cereal name and also had a mascot named Sugar Bear. Topher's Breakfast Cereal Character Guide has more on the mascots. And Dan Goosell has a photo timeline of Sugar Bear. It also appears that Sugar Bear has been downplayed, through no fault of his cavity-causing self. And according to Wikipedia, Canada held firm against this change and the cereal has always been Sugar Crisp with mascot Sugar Bear there. There's also Super Sugar Smacks, of course, which became Honey Smacks. Any other name changes come to mind? This commercial is so 1970s (air pollution!) it just about turns my appliances avocado. I used to love this cereal. Funny how our parents didn't care that the word sugar was in the name. At least mine didn't. But, I also had a Ding-Dong, Ho-Ho, or some kind of Hostess snack in my lunch everyday, and I turned out just fine. And well preserved. Oh, man, Sugar Bear was so cute before he got Hanna-Barbera'd.